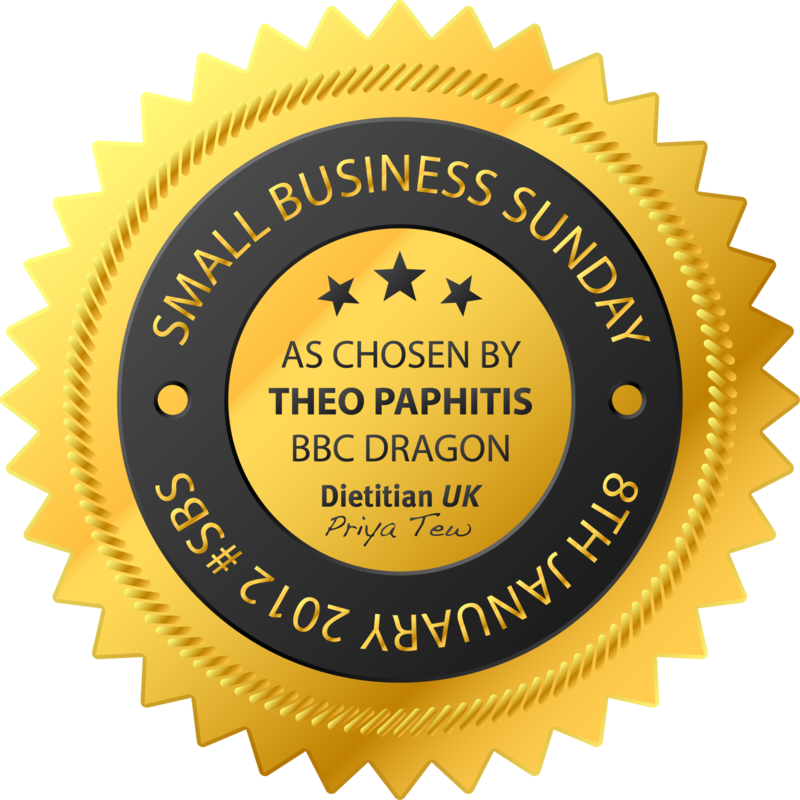 This week Dietitian UK won a Small Business Sunday (#SBS) Award from Theo Paphitis from Dragonʼs Den. This is a weekly competition on Twitter. 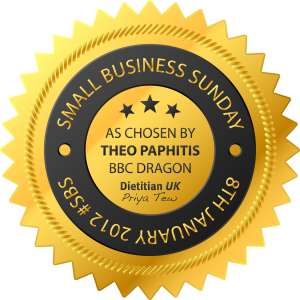 Small Businesses send a tweet saying what they do and Theo chooses 6 businesses which he then re-tweets to all of his followers. This week I decided to join in the fun and was absolutely pleasantly surprised to WIN. I’m very excited to see where this may lead and hope it not only helps my business but that it boosts the profile of other dietitian’s too. Dietitian UK is a small, local business, based in Southampton, Hampshire that works with companies, businesses, community groups and individuals with the aim of giving sound, effective nutrition advice to improve health. Work includes private consultations, menu redesign, recipes, product work, leaflets, PR and media work. Priya is a registered dietitian with a passion for nutrition, she loves to inspire change and creativity in eating. With her experience and a fresh approach Dietitian UK can help you and your business. Hydration – Am I drinking enough? The human body is 50-70% water, we cannot survive without it. Water carries nutrients around the body and waste products out of the body, it helps regulate body temperature and acts as a lubricant. It can also help with weight loss! It’s well known that it’s not a good idea to get dehydrated. This can lead to fatigue, headaches, thirst, weakness, your speech and mental alertness can be affected. However this doesn’t mean you should drink as much as possible. Too much fluid (overhydration) will dilute the sodium and potassium balance in your blood, possibly leading to brain seizures and behavioural changes. How do you know you are getting enough fluid? It’s not pretty but the best way to tell is to look at your urine. If you are properly hydrated your urine should be a light yellow colour (1-3), if it is 4-5 you should have a drink and the 6-8 range is dehydration. Specific guidelines have not been set for adults in the UK as there is so much variability between individuals. As a dietitian I use the figure 35ml of water per kg of body weight. This means a 70kg person would need about 2.5 litres of water a day. 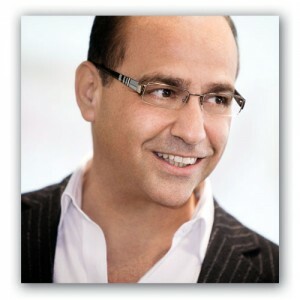 Surveys carried out on the UK population show men take in average of 3.4 litres a day and women 2.7 litres fluid a day. Sounds like a lot? This isn’t all through drinking fluid. We take in water from our food as well, around 1 litre a day. The best thing to do is to drink little and often, according to thirst. Have drinks with meals and if you are out and about a lot, take a drink with you. Water is always the best drink to have, but not always what you want to drink. You can safely drink up to 4 cups of tea and coffee a day. Other good choices include 1 glass of fruit juice a day, milk, no added sugar squash, fruit and herbal teas. Vitamin D, do you get enough? Vitamin D is one of those nutrients that we often forget about yet is very important. Suddenly, it’s having a come back and becoming a hot topic. Hands up if you know what vitamin D is even needed for? Those of you who said bone health get a gold star. Vitamin D helps your body absorb calcium, specifically your gut. It helps you maintain the levels of calcium and phosphate in the body so that you have enough for bone mineralisation and bone growth. It also plays a role in cell growth, immune function and reducing inflammation in the body. Too little vitamin D affects your bones, they can become thin and brittle. Rickets in children and osteomalacia/osteoporosis in adults are due to too low vitamin D levels. Worryingly rickets is on the rise in the UK, as is osteoporosis. So we really need to be thinking about looking after our bones. Children 1-7 months need 8.5μg/d and those aged 7months-3 years 7μg/d, pregnant and breastfeeding women 10μg/d. There are no set levels for those 3-64 years but it is now recommeded all adults take a 10mcg supplement daily or at least in winter months. Why? Most people know we make vitamin D when we step into the sunshine, however there are numerous issues with this. To get enough of the right type of sun’s rays all year round you need to live in the right area of the world. In the UK we unsuprisingly don’t fall into that category. Having pale skin means you accrue vitamin D 10 times faster than darker skinned people, but we are now out in the sun less and less, plus when we are out there is usually sun cream on the skin preventing the UVB rays getting through and so stopping vitamin D being made. Somewhere we need a balance. After World War II the NHS was born (1947) and vitamin drops were given to all children under 5 for free, these included vitamin D. This is not standard practice now and many little ones are not getting enough of the D love in their life. In fact my little one wasn’t until recently. But what about vitamin D in foods I hear you all cry…well that’s the main problem, it’s not found in that many foods. Here’s a few – oily fish, some canned fish, shitake mushrooms, eggs and fortified cereals and margarine. In America milk, orange juice and cheese is all fortified too. There’s a debate over whether more foods in the UK should be fortified at the moment. What do you think? Local Produce, Give it a Go. Local produce has always been around, local farmers have always been growing and producing, but somehow over the years we stopped buying it. The excitement of trying new “foreign” foods, the emergence of supermarkets containing almost every food you could ever want and prices have drastically changed the way we shop. Small shops are dwindling away and farmers have had to change the ways they do business. Take a look in your kitchen, where did you shop this week? Where did your fruit come from? Who looked after your chicken and what type of life did it have? Is anything local?! I absolutely love Farm Shops (my husband will tell you that), whenever we are driving around and I see one a cry comes out of my mouth “Farm shop, Farm shop” and often my lovely, obliging husband will pull over and let me browse, smell, pick up foods and drool over yummy things. 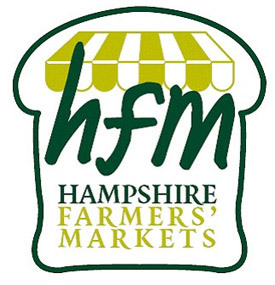 Living in Hampshire there are many Farm Shops off the beaten track, but also my local butcher sells local meat, a well known supermarket shop nearby had local strawberries in last week and some of our farm shops deliver weekly, plus our local chickens live at the end of my garden 😉 If you look around your area I bet you can find a way to get some local food. Look out for farmers markets and food shows too. Local produce is any food that has been grown, raised, cooked, baked or produced within your locality. So what are the benefits of eating local produce? 1. Usually local produce has been well looked after – animal will have had space to roam, have been fed on healthy foodstuff and provide quality, tasty meat. Fruit and veggies will be grown as naturally as possible. 2. Buying locally is eco-friendly, less transport costs, you can even go and pick it up from the farm or have it delivered direct to you from the field. 3. Food is fresher, so tastier. The fresher your fruit and veggies the better they are nutritionally. 5. Often farm shops and farmers markets have a great range of different foods – I’ve recently had watercress sausages, locally made biltong and some amazing apricot liqueur. 6. Food festivals and markets give you a chance to try before you buy and get ideas on recipes and cooking from the producers. 7. Buying what is in season can be cheaper. Stock up when things are in season, cook and freeze for later on or wrap and store veggies if they are suitable. So how about taking up the challenge…try shopping locally for even some of your shop this month. Does Personality affect your ability to lose weight? This week I was interviewed and quoted by a newspaper about a book written on personality and dieting. Daniel Amen thinks that there are 5 types of overeater – compulsive, impulsive, compulsive-impulsive, emotional and anxious overeaters. He suggests that each group of person should avoid certain foods and eat more of others in order to lose weight. This is all based on brain patterns as Daniel is a neuroscientist. Personally I agree that there are different types of overeaters and personality does definitely affect the way people eat. We all know people who eat more when they are anxious and others who just have to eat food if its in the house but can resist if its not there. It would be right to say that different personalities respond to different approaches. For example some people work well with tackling their body image first, others want practical goals and some need a focus on activity. However I don’t agree with the food advice that Mr Amen gives. 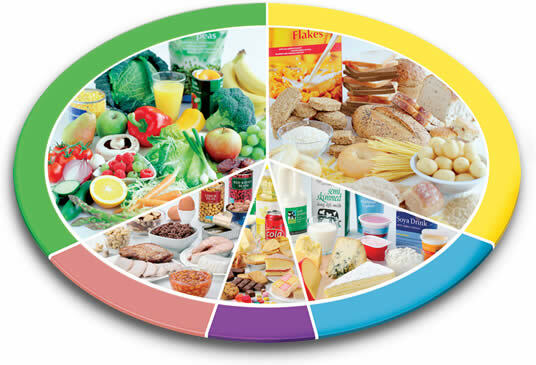 Whatever type of person you are a healthy balanced diet is key to weight loss combined with activity. The key ingredient is to have a personalised plan that suits your lifestyle and your food likes/dislikes. If your eating plan and activity plan are not based on things that you enjoy you are not likely to stick to them! Cutting out food groups like carbohydrate is never a good idea no matter what your personality. My other thought is that some people may use this concept as an excuse… “well I can’t lose weight easily due to my personality. ” In admit it is really not easy to lose weight, it takes time, dedication and lots of hard work, sweat plus some tears, but the health benefits are amazing. Losing 10% of your body weight if you are overweight reduces your risk of chronic diseases such as diabetes and heart disease, it can help improve your overall sense of well being and your ability to go about everyday life. Don’t put your health on hold, get your nutrition and activity sorted out as a matter of priority, it really will change your life. Sweets linked to less overweight children. So here is a link to a recent article I was quoted in… it got me thinking. The article was about a study that followed a more than 11,000 children from 2-18 years over 5 years. They found children who ate sweets were 22% less prone to be overweight or obese compared to those who did not eat sweets. I think it’s a good example of how media spin can confuse people, the headline suggests we should be feeding our children more sweets. Surely not helpful in a society that is struggling with obesity and diabetes. What is not mentioned is how often sweets were consumed by these children or how active they are, and the rest of their diet is also a huge factor. This study was not a case of letting children overindulge in “treat” foods but showed that children who regularly ate sweets learnt how to eat sensible portions and balance their food intake. Having small children this is a topical area for me. I want my children to grow up appreciating how to have a healthy balanced diet and that includes how to eat sweets and chocolate on a semi-regular basis in sensible amounts. Therefore I need to firstly model this myself and secondly let my children eat these foods so they learn how to moderate their intake. Fatty and sugary foods are included in the EatWell plate (see below image) that we use to demonstrate balanced eating so remember its ok to eat these foods its just how often and how much of them you eat 🙂 I’m off for a couple of squares of dark chocolate mmmmm. Healthy Eating on a Plate. I’ve been working with a client who literally must rattle if she walked, which is doesn’t do often. She is largely bed-bound and is trying to use supplements as a way to get her better and boost her energy levels. Now I’m not against supplements on the whole but I do think that we need to be careful with them and use them sparingly. The nutrition world is growing at such a fast pace and there seems to be a new supplement coming onto the market every week with one for every occasion! A lot of money is spent by people trying to be healthy. But are they really needed? Taking a multivitamin/mineral on a daily basis seems to be the most common supplement. Whilst this is not harmful and can be very helpful to people who are struggling to eat a balanced diet, it also shouldn’t be necessary for most people. A healthy person should be able to get everything they need from food. The benefits of eating a well balanced diet instead of using supplements are huge. 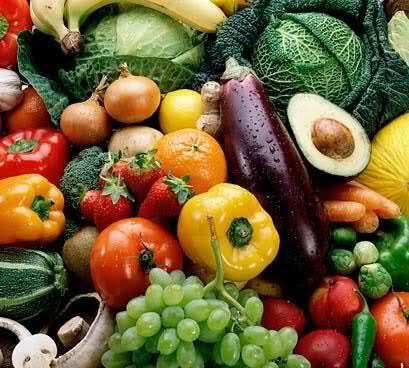 If we think about fruit and vegetables alone there is research linking eating these colourful foods to a reduction in blood pressure, cancer risk, heart disease, stroke and diabetes. Your multivitamin isn’t going to do all that. Plus lets face it food just tastes a lot better than a pill. For some people supplements are a definate yes. Before and in the first 12 weeks of pregnancy 400mcg folic acid is proven to reduce the incidence of neural tube defects. People at risk of osteoporosis should take calcium and vitamin D. In fact the whole UK population is recommended to take a Vit D supplement of 10 mcg/day. Some vegetarians may need a B12 boost. If you have low iron then iron supplements can helpf ro at time. These are all specific conditions. Anyone with a deficiency may need a supplement to help out for while and there are numerous people who can’t get everything they need from food for various reasons so need a supplement. In my eating disorder job I often recommend clients take a supplement whilst they rebuild their eating. However, if we can get all our nutrients from our diet it is so much better for us. Think natural rather than manmade. There’s also issues with overdosing on some nutrients. Some of these nutrients will just be lost from the body when it is saturated with them, others can cause tummy upsets and health problems. So be cautious with mega doses! The research is still being done on lots of these things. Until the research comes in, if you can, try to get as much goodness as possible from your food and take a Vit D supplement, especially in those winter months. Over 5 portions of fruit and veggies a day (preferably over 7). Wholegrains including wheat, rye, barley and oats, the less processed the better. Starchy carbohydrate foods at each meal. Dairy foods 2-3 times a day. Low fat, low sugar options of foods. Lean proteins – meat, fish, pulses, beans.